Dorset Police are urging people to keep a recent decrease in Halloween anti-social behaviour going this weekend. The force is suggesting that trick or treaters are supervised by an adult and only go to houses they know - and avoid any with 'no trick or treating' signs up. Police say anti-social behaviour over the Halloween period has been declining since 2014 in Dorset. "We are well aware that people want to enjoy the Halloween festivities, including going trick or treating, and the last thing we would want to do is spoil anyone's fun. We just ask that people are respectful to those who don't want to participate. "Our advice is to ensure that trick or treaters are always supervised by an adult, and only call at properties which are known to them. Ideally, these visits should be arranged in advance. 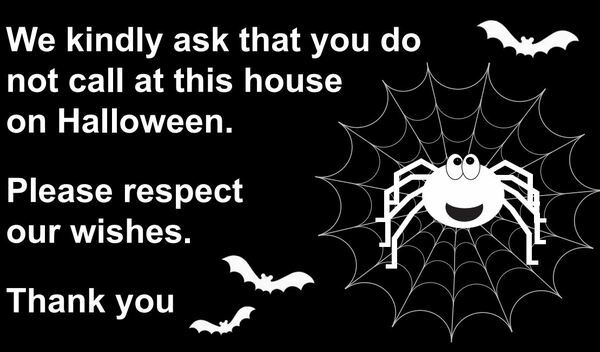 "If homes are displaying 'No trick or treating' signs, or residents ask you to move on, please do so politely. "There are members of our communities who might find this time of year intimidating. Vulnerable people may be distressed if they are disturbed by people they do not know, particularly late at night. "Halloween is an opportunity for people to enjoy themselves: it is not an excuse to make people feel uncomfortable, scared or to participate in anti-social behaviour. "Put yourselves in the position of those who do not want to take part, including vulnerable people, parents with a new baby or shift workers, and also think about your own safety." A poster has also been created for shops to display, informing customers that they will not be selling eggs or flour to anyone under the age of 18 over the Halloween period. Police say throwing objects like eggs and flour is criminal damage and can result in a fine or even a prison sentence.